This article originated as a paper given at the Canadian Association for Irish Studies annual conference at Quebec in June 2018. Think of this as an essay on the three sins of recycling history, reading history backwards, and misusing evidence. It concerns Jim McDermott, a Fenian firebrand from New York who enters Canadian history on St Patrick’s Day 1865, when the Hibernian Benevolent Society in Toronto invited him to speak. He was greeted with “vociferous cheers,” after which he expatiated at length on the superiority of the American over the British system of government. He received more cheers when he asserted that England held Canada “against the desire of the people,” and even louder ones when he declared that Irishmen were ready to proclaim “a free and independent Republic on the ruins of the old kingdom.” “The Fenian Brotherhood,” he continued, “were resolved to try the only experiment that had not been tried – organized revolution!” His twin messages of annexation for Canada and revolution for Ireland not only received the “unbounded applause” of his immediate audience, but were in such high demand that the Irish Canadian sold out within hours of publishing the speech. It reprinted the lecture in its entirety the following week. But Jim McDermott enters Canadian historiography in a very different way: As the “Special Informant” who supplied the British consul in New York, Edward Archibald, with crucial information that alerted the authorities about the Fenian plans to invade Campobello Island in New Brunswick – plans that were made in a meeting in New York held by the Fenian leader John O’Mahony on March 17 1866. The Fenians left New York during the first week of April, and began arriving in Eastport Maine around April 10. By the time they were settling into Eastport, a British warship had reached Campobello Island to deter an attack, and the New Brunswick militia were waiting at the border. Over the next two weeks, the attempted raid degenerated into farce and fizzled out. McDermott’s information, the argument runs, was a key factor – and for some, the key factor – in its failure. The list of Canadian and Irish historians who have identified McDermott as Archibald’s “Special Informant” includes just about everyone who has written on the Fenians in North America – Hereward Senior, Wilfred Neidhardt, Robert Dallison, Desmond Ryan, Leon Ó Broin, Brendan O Cathaoir, Brian Sayers and Owen McGee, among others. Distinguished company, indeed. McDermott was indeed a “notorious Fenian informer” – fifteen years later. There is no doubt that when the Fenians undertook their bomb campaign in Britain during the early 1880s, McDermott operated as an informer and an agent provocateur. The assumption, then, is that because McDermott was an informer in the 1880s, he must have been one in the 1860s – and therefore must have been Archibald’s “Special Informant” in 1866: reading history backwards. The only trouble is that there isn’t any evidence in contemporary primary sources to back it up, and some evidence that might suggest otherwise. And it should be a basic rule that if we don’t have the evidence, we shouldn’t make unqualified assertions. William D’Arcy, though, does cite a primary source to support his claim. He bases his statement on a letter written by Archibald on April 17 1866, in which Archibald says that he’s had, “of late,” several interviews and communications from his “Special Informant,” who told him that the raid had been planned by the Fenian Secretary of the Treasury, Bernard Killian. Campobello had been chosen, Archibald learned, because it was supposed to be disputed territory between the United States and Britain; the idea was to trigger a war between the two countries, and create the space for a revolution in Ireland. The Special Informant also said that O’Mahony himself had quickly come to regret the decision. Note two things straight away. First, Archibald does not name his “Special Informant.” Second, the letter does not support the view that Archibald knew about the raid before it happened. He wrote it nearly two weeks after the Fenian expedition left New York for Maine, and he said that he had received his information recently – “of late,” in his words. When did Archibald know about the raid? According to Hereward Senior, “Surprise was impossible because the decision to seize Campo Bello, made on March 17, was revealed to the British consul in New York on March 20 by James MacDermott.” Senior did not provide a primary source to back this up, for the very good reason that he did not have one. On March 21, Archibald told the Foreign Secretary Lord Clarendon that “I can learn nothing further of an attack on Campo Bello, and do not think any thing of the kind is now meditated.” He was still in the dark on April 7, when he opened up his copy of the New York World and read that the expedition had sailed for New Brunswick, and dismissed it as yet another Fenian rumour: “No sane person could for a moment give credit to such monstrous absurdities,” he told Clarendon. In his correspondence with Arthur Gordon, the Lieutenant-Governor of New Brunswick, Archibald had no firm idea what the Fenians were up to until their presence in Eastport was already common knowledge. In fact, by April 11 it was Archibald who was learning about the situation from Gordon, not the other way round. The hard truth is that Archibald got the information about the raid not from his “Special Informant,” but from a New York newspaper, and dismissed it as being beyond belief. The report that was used as evidence that he knew about the raid in advance was actually written after the fact. The argument that Archibald supplied information that alerted the authorities to the Campobello raid is just wrong. And the assertion that McDermott was the informer remains an open question. Some historians who point the finger at McDermott note that O’Mahony received at least two warnings about him in 1864. One came from the Fenian chief James Stephens, and the other from Patrick Downing. Neither of their letters, however, raise the possibility that McDermott could have been an informer. Stephens warned that he was a loose cannon whose hot-headed lectures could damage the cause, and Downing complained that he could not be trusted – which ultimately, of course, proved to be the case. Long after McDermott had been outed during the 1880s, John Devoy wrote that McDermott had been widely regarded a blackguard who was “constantly fomenting trouble by lying stories which he put in circulation or told ‘confidentially’ to numbers of people, with the intention that they should be spread.” Still, Devoy was not prepared to assert that McDermott was the Campobello informer – probable, but not proven, was his position. More damning was a reference in Michael Davitt’s Fall of Feudalism, published in 1904, that an “ex-official of the Canadian government, who served under Sir John Macdonald,” told him that McDermott had been an informer since 1865. Like Devoy, he reckoned that this was probably true. You’ll note the contrast between the caution of Davitt and Devoy, and the categorical statements of the historians who followed them. And, for all I know, McDermott may well have been Archibald’s Special Informant. But there’s one piece of evidence that points in another direction. Remember that in his letter of April 17, Archibald writes that he has had “of late” several interviews with the informant. With this in mind, let’s travel to Eastport Maine as the Fenians are gathering during the second week of April. The editor of the St. Croix Courier stayed at the hotel where the Fenian leaders were based, and reported that Bernard Killian, the leader of the expedition, was accompanied by two secretaries. One of them was described as “a rough Irish lad, evidently lacking in brains, judgment and experience, as quiet as a mouse in the presence of his master, but garrulous and bombastic when the latter is out of sight.” His name, we are told, was McDermott. The description doesn’t fit with that of Archibald, who said his Special Informant was intelligent, but it does fit with Devoy’s description of a trouble maker who could not be trusted and liked to shoot off at the mouth. If it was the same person – if – then he could not have been having interviews with Archibald in New York shortly before the April 17 letter. On the other hand, the editor of the New York Irish People newspaper reported that James McDermott was still in the city, along with O’Mahony, after the expedition to Eastport took place. When we don’t know things, we should just say so. We can’t be sure if McDermott was the Special Informant, but we do who we’re looking for: a young clerk in the War Department of the O’Mahony wing, who was taken off the payroll sometime before mid April 1866. So far, the Fenian records have proven insufficiently detailed to provide the answer. It is certain, though, that the Special Informant, whoever he was, had nothing to do with alerting the authorities to an impending Fenian raid on Campobello Island. Which leaves us with one further question: How, then, did the authorities in New Brunswick learn that their province was under threat, with the result that they began to prepare for its defence? Rumours about an attack in the Maritimes began to circulate towards the end of 1865, but it wasn’t until March 2 1866 that Archibald learned that Campobello might be a target. Archibald reported that someone in the rival Senate Wing of the Fenian Brotherhood had told a member of the New Brunswick Legislative Assembly that “discussions have taken place relative to the seizure of the Island of Campo Bello as a portion of British territory on which the Flag of the Irish Republic could be hoisted, and from whence privateers could be conveniently despatched.” “The project,” he added, “is not improbable, and its sudden execution might be practicable.” The member of the Legislative Assembly was Charles Beckwith, the owner of Campobello Island. The Senate Wing had indeed discussed taking Campobello, just as they had discussed taking an island in the West Indies to use as a base against British shipping. But they very quickly dropped both ideas, and decided to focus on Canada instead – i.e. present-day Quebec and Ontario. So we are left with an irony: The information that led to the mobilization of defence forces in and around New Brunswick came from someone in the Senate Wing, not the O’Mahony Wing, and turned out to be inaccurate. Preparing for an attack that the Senate Wing had decided not to make, the authorities in New Brunswick accidentally found themselves ready for the attack that the O’Mahony Wing was actually attempting to carry out. In short, they stumbled across the truth in the resolute pursuit of error. Update (March 15, 2019): Upon reading this article, Anna Peretiatkowicz of the Dictionary of Canadian Biography applied her research skills to the problem, and located a cache of letters that provided important clues as to the identity of Archibald’s Special Informant, and that opened up new leads in Irish and British sources. It is now clear beyond a shadow of a doubt that the Special Informant was not Jim McDermott. I now know the true identity of the informer, but that will not be revealed until the publication of my book Double Lives: The Fenians and the Canadian Secret Police — coming not-so-soon, with McGill-Queen’s University Press. A special thank you to Anna Peretiatkowicz for her invaluable help. David Wilson is Professor in the History Department and Celtic Studies Program at the University of Toronto. He is the General Editor of the Dictionary of Canadian Biography. He is writing a book on the Fenians in Canada and the origins of the Canadian secret police force. If anyone can shed light on the identity of Archibald’s “Special Informant,” he would be delighted to know. Irish Canadian, 22, 29 March 1865. Hereward Senior, The Fenians and Canada (Toronto: Macmillan, 1978), 92; Wilfred Neidhardt, Fenianism in North America (University Park and London: The Pennsylvania State University Press, 1975), 92; Robert L. Dallison, Turning Back the Fenians: New Brunswick’s Last Colonial Campaign (Fredericton: Goose Lane Editions and the New Brunswick Heritage Project, 2006), 22; Desmond Ryan, The Fenian Chief: A Biography of James Stephens (Dublin: Gill and Son, 1967), 202-4; Leon Ó Broin, Fenian Fever: An Anglo-American Dilemma (New York: New York University Press, 1971), 62; Brendan O Cathaoir, “A Confederate Felled by Fenians,” Irish Times, 16 June 2012; Brian Sayers, “John O’Mahony: Revolutionary and Scholar (1815-1877),” Ph.D. dissertation (National University of Ireland, Maynooth, 2005), 320; Owen McGee, “James McDermott,” Dictionary of Irish Biography (New York: Cambridge University Press, 2004). William D’Arcy, The Fenian Movement in the United States: 1858-1886 (New York: Russell & Russell, 1947, rpt. 1971), 140. Edward Archibald to Lord Clarendon, 17 April 1866, “Confidential Despatches,” RG 7 G 10, Library and Archives Canada. Senior, Fenians and Canada, 92. Archibald to Clarendon, 21 March 1866, Fenian A Files, 126, National Archives of Ireland. Archibald to Clarendon, 7 April 1866, Fenian A Files, 133, National Archives of Ireland. See, for example, Archibald to Gordon, 7 April 1866, RS 558/D/1b, Public Archives of New Brunswick. Archibald to Gordon, 11 April 1866, RS 558/D/1b, Public Archives of New Brunswick. Archibald to John Michel, 13 December 1865, “Confidential Despatches,” RG 7 G 10, Library and Archives Canada. Archibald to Clarendon, 17 April 1866, “Confidential Despatches,” RG 7 G 10, Library and Archives Canada. Stephens to O’Mahony, 1864, in Joseph Denieffe, A Personal Narrative of the Irish Revolutionary Brotherhood (Shannon: Irish University Press, 1969), 185-6; Downing to O’Mahony, 20 April 1864, Fenian Brotherhood Collection, Catholic University of America. John Devoy, Recollections of an Irish Rebel (New York: Charles P. Young, 1929), 269-70. Michael Davitt, The Fall of Feudalism in Ireland, or the Story of the Land League Revolution (London and New York: Harper & Brothers Publishers, 1904), 429. Saint Croix Courier, 14 April 1866. Irish People, 14 April 1866. Archibald to Monck, 3 March 1866, “Confidential Despatches,” RG 7 G 10, Library and Archives Canada. See, for example, Cornelius Sullivan [alias for Charles Clarke] to Gilbert McMicken, 3 March 1866, John A. Macdonald Papers, MG26-A, Library and Archives Canada. 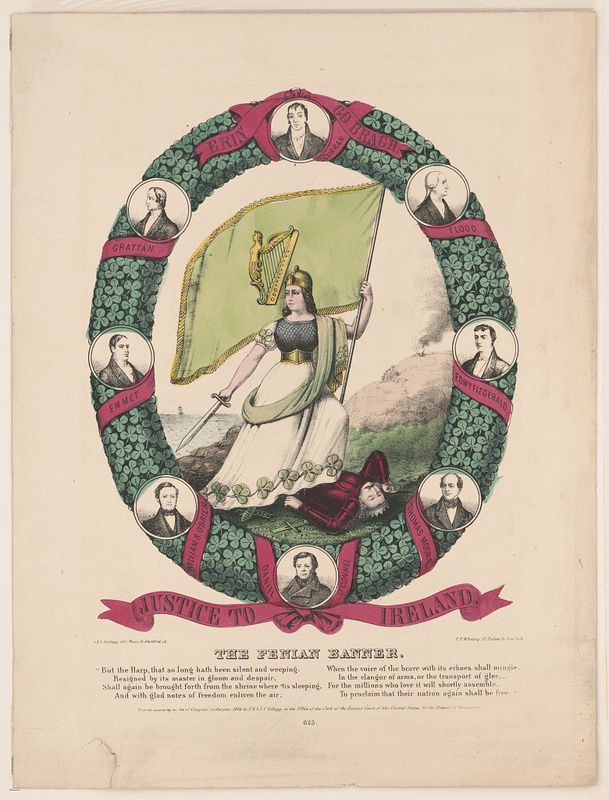 Featured Image: The Fenian Banner, 1866, Library of Congress, https://www.loc.gov/item/2003656467/.